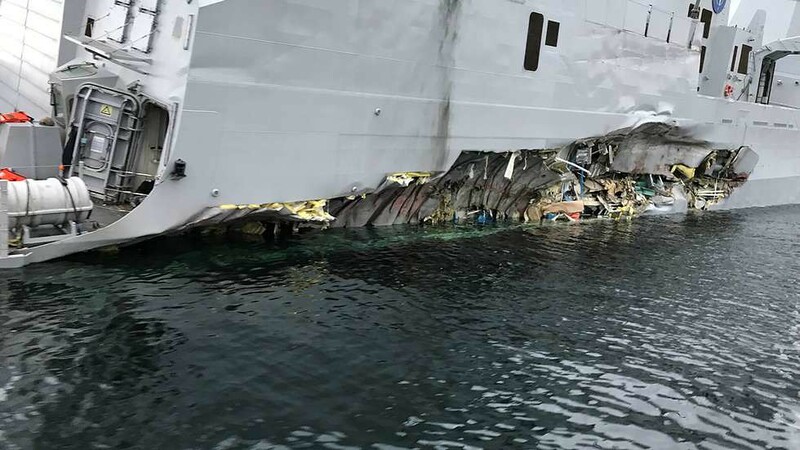 In the early hours of today, the frigate KNM Helge Ingstad F-313 of the Royal Norwegian Navy has been seriously damaged after colliding with a Maltese petroleum 250 meters in length, the Sola TS. 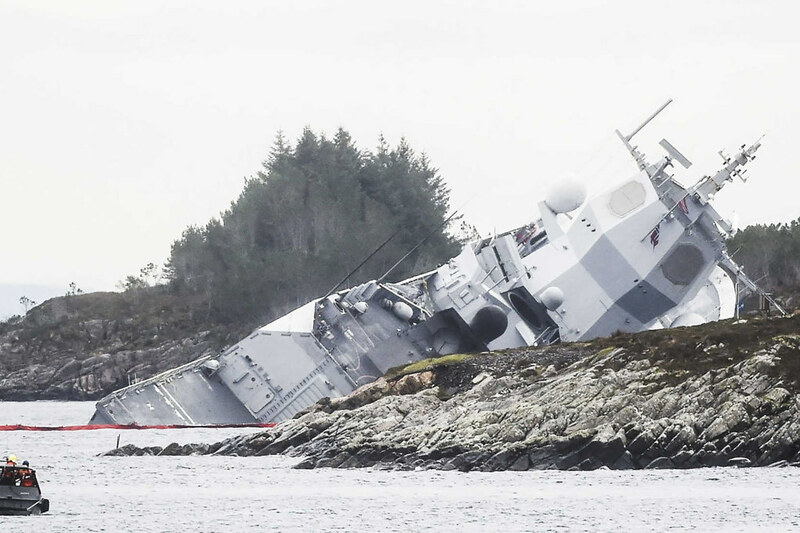 A waterway was opened to the Norwegian warship and it was pushed towards the coast by tugboats, with the aim of making it run aground to avoid its sinking. The frigate belongs to the Fridtjof Nansen class, was built in Ferrol (Spain) by Navantia and was launched on November 23, 2007, receiving the discharge in the Norwegian Navy on September 29, 2009. The Fridtjof Nansen class is a variant of the F-100 frigates built by Navantia for the Spanish Navy. 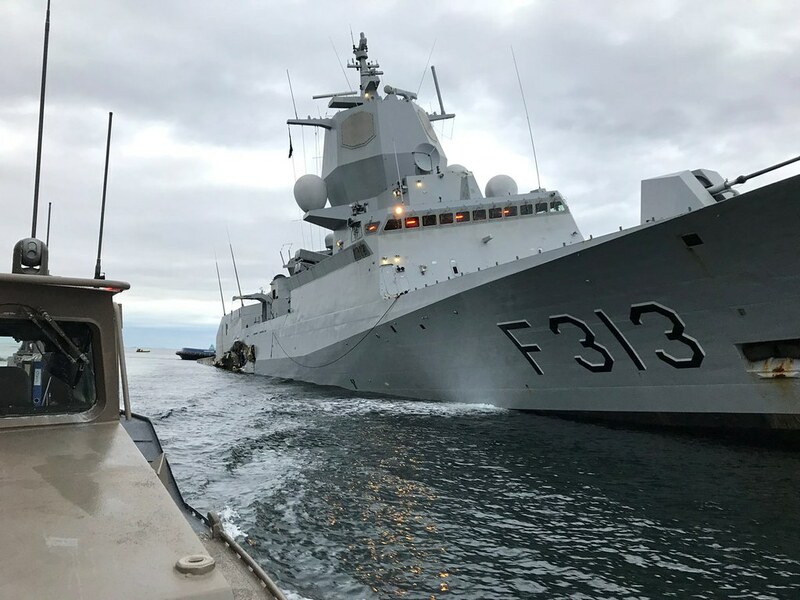 In total, Norway has received five of these vessels: the KNM Fridtjof Nansen, the KNM Roald Amundsen, the KNM Otto Sverdrup, the KNM Helge Ingstad and the KNM Thor Heyerdahl. 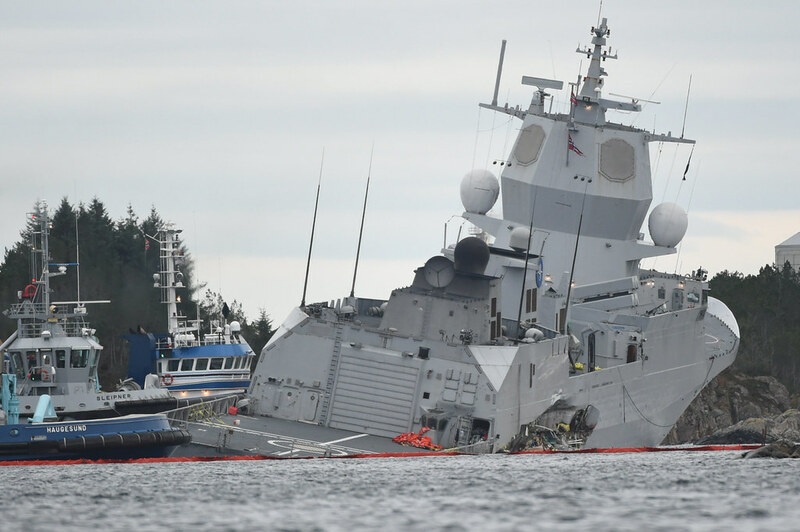 The accident occurred north of the Sture terminal, in the municipality of Øygarden, in the province of Hordaland, in southern Norway, when the Norwegian frigate returned from its participation in the NATO Trident Juncture 2018 exercice, which precisely has been developed these last days in the Nordic country. The collision has left a large gap in the starboard side of the vessel, partially exposing one of the Sting Ray torpedoes launching camera (seen in the center in the next photo). The exit door of the torpedoes is observed in the following photo, on the right. 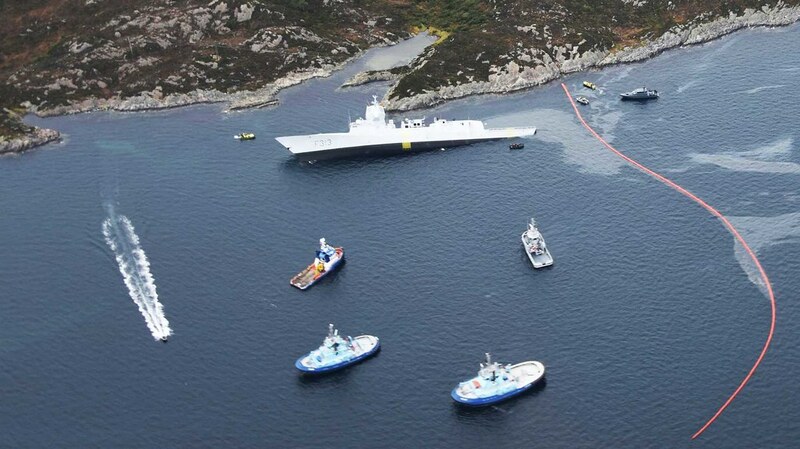 As seen in this aerial photo, the frigate has been very tilted to starboard, after the operation carried out by the tugs to run it on the coast and prevent its sinking. 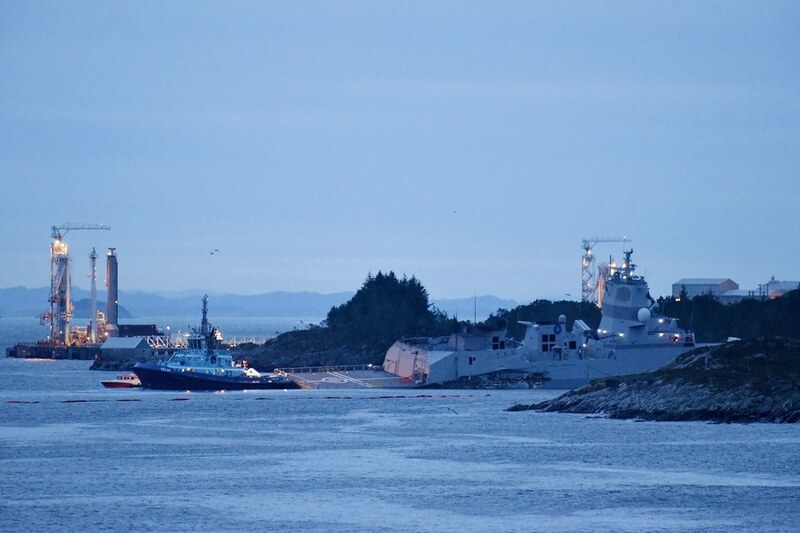 A barrier has been installed to contain the fuel poured by the vessel after the collision. 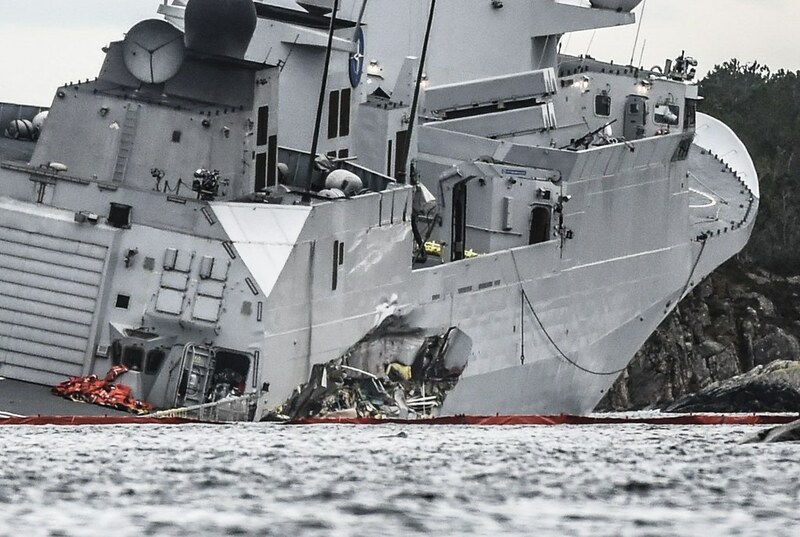 In this video recorded from a surveillance plane of the Kystverket (the Norwegian Coastal Administration) we see the state of the frigate at 7:26 this morning. As seen in this other video taken at 10:17 this morning, the ship at that time was already partially submerged. 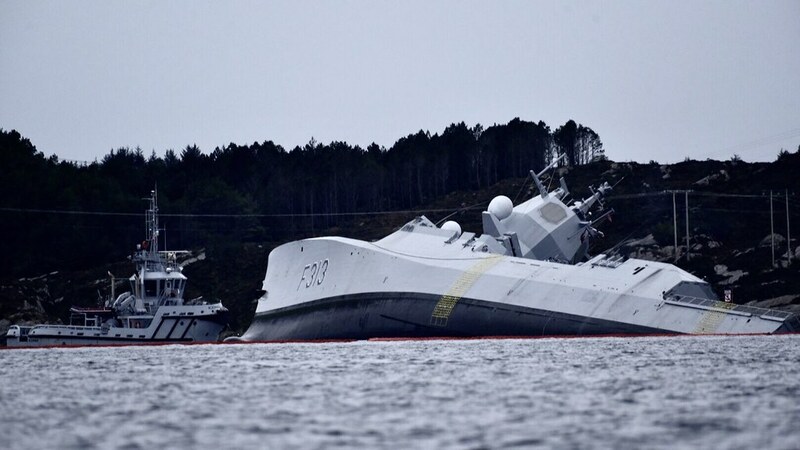 I hope that the Norwegian Navy manages to save the ship, it would be a pity if you lost a frigate as new and as valuable as this one. + UPDATED 11.9.2018 4:25pm: New video recorded by the plane of the Kystverket at 8:20 this morning. The frigate’s command bridge is already partially submerged. In the final part of the video you can see the fuel stain affecting a large part of the coast.